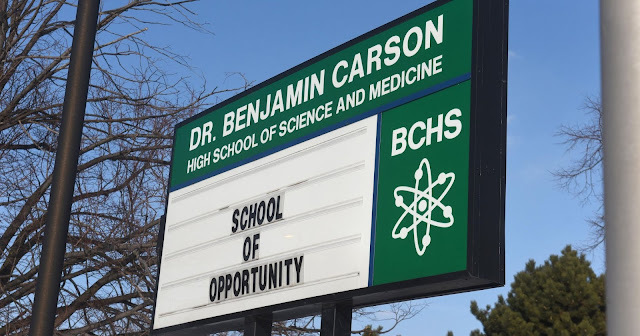 Ben Carson's name may be stripped off a high school in his hometown because he's become 'an affront to Detroit' since joining Donald Trump's administration. The Benjamin Carson High School of Science and Medicine was named after Carson, a prominent neurosurgeon, in 2011. But it appeared that members of the Detroit Board of Education have had second thoughts about the name since Carson ran for the Republican presidential nomination in 2016, and later became a member of Trump's cabinet. He currently serves as the Secretary of Housing and Urban Development. 'When you align yourself with Trump, that is a direct affront to the city of Detroit and the students of Detroit,' said board member LeMar Lemmons earlier this year. On Tuesday, the board voted 6-1 to begin soliciting public opinion on the potential name change. On Tuesday, the board approved a policy that would allow it to rename schools named after living people, if they feel that person no longer represents the area's culture or population. Future schools will only be able to be named after people who have died. One board member suggested the first school to benefit from the new policy should be the Benjamin Carson High School. Carson's popularity has plummeted since working with the Trump administration.